Broccoli is a cool weather crop that generally thrives in cooler temperatures that do not exceed 30°C (86°F). The ideal temperature for cultivating broccoli is between 65 - 75°F. Broccoli should be planted in an open, sunny or partially shaded area. I like to soak seeds for up to 24 hours before planting. Sow broccoli seeds thinly, approximately 1/4 inch deep in rows that are 2 feet apart. Cover the seeds loosely with soil and water well. The seeds will germinate within about 10 days and then the seedlings can be thinned out to 1 foot apart (for Calabrese). Spring Raab Rapini Broccoli is an excellent variety for shorter growing seasons and gardeners who want a quick-growing crop. 36 days. Broccoli Raab is also known as broccoli Asparago in Italy where it is prized for being a culinary delight. Spring Rapini doesn't grow like the broccoli most people think of. It doesn't have a central head, but rather it is treasured for its cluster of yellow buds. Matures very quickly from seed. Green shoots have a captivating flavor. Cut 6" pieces when the "broccolis" are the size of a quarter. Calabrese is another fast-growing crop and some varieties will be ready to harvest from anything between 40 - 65 days. 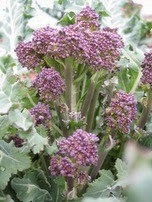 If sown in April or May, the broccoli should be ready to harvest from July onwards until November. In warmer climates, plant early in the year and again in Fall. 48 days. (Brassica oleracea) An Italian heirloom that was brought to America in the 1880s, 5-8" heads and many side shoots. For the best results, broccoli should be planted after a crop of peas or beans, as these vegetables leave deposits of nitrogen in the soil, which is much needed by the broccoli for healthy growth and development. 75-100 days. The true and popular Italian heirloom with spiraling, apple-green heads that are so superbly flavored. Romanesco broccoli heads are really densely packed clusters of lime green flower buds that develop in the center of a leafy rosette. This variety is widely grown in northern Italy. Harvest the broccoli when the side florets start to loosen slightly but the main head is still very compact. Cut at the base of the stalk, so that the main head is removed. If you are interested in growing broccoli organically, you can work some compost or well-rotted manure into the soil before planting. You can also use organic products like Mary's Organic 3-4-4, Blood Meal or fish emulsions to fertilize your broccoli plants. Companion plants for Broccoli include: Basil, Bush Beans, Cucumber, Dill, Garlic, Hyssop, Lettuce, Marigold, Mint, Nasturtium, Onion, Potato, Radish, Rosemary, Sage, Thyme and Tomato. Celery, onions and potatoes improve broccolis' flavor when planted near it. Broccoli loves plenty of calcium. Pairing it with plants that need little calcium is a good combination such as nasturtiums and beets. Put the nasturtiums right under the broccoli plants. Herbs such as rosemary, dill and sage help repel pests with their distinct aromas. Cabbage loopers: Small holes on the leaves between the veins mean small green caterpillars are present. Look at the undersides of the leaves. Thank you for sharing how to grow broccoli from seed at the Healthy, Happy, Green and Natural Party Blog Hop. I’m Pinning and sharing!